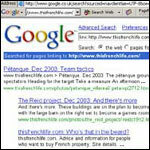 USING search engines to promote your website can be an easy way to advertise your business. A huge percentage of search engine traffic comes through Google and Yahoo, but you shouldn’t spend hours trying to get to the top of the listings. IF you are struggling to find inspiration for writing articles on your subject then a few web-based tools will help you out. Joining newsletters of other sites on your subject will always spark ideas in your head when it arrives in your in box. SIGNING up to be an affiliate of a company should be a quick and simple operation so you can get on with promoting the products. On the TradeDoubler site you can register as a publisher and within a few minutes be linked up to many top brand names such as John Lewis and Dell computers. ONCE people have set up their business website many just leave it to merrily hang around on the internet hoping to catch passing customers. But those who promote their site effectively will get plenty of people visiting it and using the services you offer. ONE of the best ways to earn a living online is to have a selection of website focussed around a subject you are interested in. But the cost of setting up sites and the time taken to update them has to be kept to a minimum, especially if you have a dozen or more sites. IF you are using photographs on your website make sure they are presented in the best possible light. Your photographs need to be produced in a common format with a resolution of 72dpi, which is suitable for displaying on computer screens. ALTHOUGH actual products are popular items to sell on the internet, the most lucrative are actually digital products such as ebooks and software. One of the biggest websites promoting these types of products is ClickBank with over 10,000 digital items on the site.